It’s going to feel more like July 8 as opposed to September 8 today, but the cooler weather of autumn really is just about the corner. Soon we will break out the fleece and start taking in the beauty of changing leaves in our pretty part of the world. And local food goes through a transition as well. - Apples, apples, and more apples: Places like Harner Farms, Way Fruit Farm, and Donnelly Orchards in Huntingdon already have the first of the fall apples on hand. Many of the local orchards produce great fall products like apple butter, apple pies, and of course apple cider (a personal favorite is Way Fruit Farms’ cider). Hard to imagine a Pennsylvania fall without apples. - And lots of pumpkins: Look, many of us are already sick of pumpkin spice stuff. It’s all over already. But real pumpkin products produced locally are a totally different animal. As evidence, I present Fasta and Ravioli Co.‘s pumpkin ravioli, a very tasty ravioli that goes well with a butter or cream-based sauce. And I would be remiss if I didn’t mention the Penn State Creamery’s pumpkin pie ice cream, which is ridiculous good. 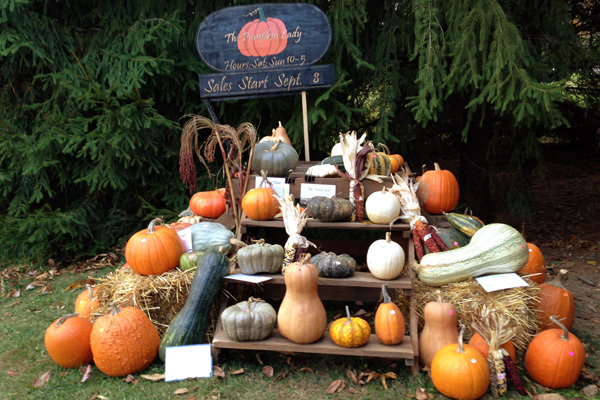 Fall festivals: There are plenty of fall events to choose from and all feature local food. There’s the Hartslog Festival in Alexandria on Oct. 8, featuring many craft and food vendors. The Howard Fire Company Fall Punkin’ Chunkin’ Festival at Bald Eagle State Park is held Oct. 22 and features flying pumpkins launched by incredible devices, and 30 food vendors including Scott Roasters, who have my personal favorite sandwich, the pork sandwich (they raise their own hogs). Of course, you can also check out your local winery web site as many are holding their own fall wine events. - Tait Farm shrub: Shrub is a drink mixer that is made with vinegar and fruit, and is flat-out delicious. Tait Farm makes a variety of them, including several that go well in the fall months, such as ginger, cranberry, and spiced apple. You can make either alcoholic or non-alcoholic drinks with them. - Fall menus at local food restaurants: What’s available to local chefs changes, as local farmers start offering more root vegetables and such. Harrson’s Wine Grill offers an Oktoberfest and Autumn Harvest special menu, Revival Kitchen changes up their ever-changing menu to reflect the season, and places such as The Deli shift their specials to more hearty fare reflective of the cooler weather. - Fall beers! : Otto’s Pub and Brewery offers up not only an excellent version of an Oktoberfest marzen, but also produces a great harvest ale in Cornucopia. Rusty Rail Brewing Company in Mifflinburg makes a delicious twist on the Oktoberfest icon via Noktoberfest which includes blood orange juice. And Happy Valley Brewing offers several creative seasonals, including a pumpkin dubbel which is so crazy, it works. Kind of like a pumpkin milkshake, but at 9.6% ABV, might want to take it easy on this one.